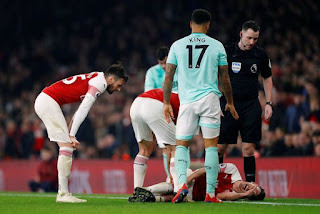 We have got good news on the injury front ahead of Arsenal's visit to the Wembley Stadium for the much-anticipated North London derby. The Gunners go into the clash against Tottenham off the back of a 5-1 win over Bournemouth on Wednesday night, courtesy goals from Mesut Ozil, Henrikh Mkhitaryan, Laurent Koscielny, Pierre-Emerick Aubameyang and Alexandre Lacazette. One of the scorers, Koscielny, sustained an injury close to the end of the clash following a challenge from Josh King. The skipper was visibly in severe pain and had to receive treatment for two minutes. He limped off at the end of the game, raising fears among fans. Unai Emery while briefing the press post-match insisted it was a minor issue, hoping the Frenchman will recover in time to make the squad by the weekend. "I hope it is just one kick," said the Spaniard. "He has three days between Saturday and I hope he will be OK."
Today via the club's official website, it was revealed that the 33-year-old is back in full training meaning there are high chances he will be seen in action tomorrow. Victory over the Cherries reduced the gap between Arsenal and Tottenham who lost to Chelsea to four points.